Unlimited Software Applications at the Push of a Button If you hire a programmer to design your software you get one application period. Not only does it take a long time but all (or a good portion) of your budget goes into development costs before you even have a chance of seeing one dime in profit. Not so with Software Designer Pro. Your design costs are virtually zero (you pay for the software creator one time and your done) and you can create unlimited applications all with just a few clicks of the mouse. Save Time and Money Thanks to Software Designer Pro, youll no longer have to spend a huge amount of your valuable time creating products. With the hours youll save you can spend more time on the things you enjoy most. Plus, youll have more time to focus on the marketing aspect of your business and not the product development phase. Potentially Explode Your Sales and Income With the ability to create unlimited software applications theres truly no limit to what this can do to your sales and profit margin. Whether you create software to sell or software to give away you can create almost an unlimited stream of potential profit generating applications. 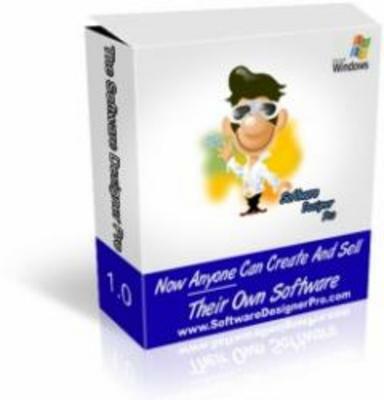 No Complicated Scripts or Programming Required You dont have to enter any complicated codes or be an expert programmer to use Software Designer Pro. This is truly a hassle free piece of software. Just pop in a recipe (well show you exactly how in the quick start guide), fill out the required information and with the click of your mouse youll have a ready-to-go software application that is all yours.